In April’s apartment, Splinter meditates, contemplating the evils of the night. Suddenly, the Turtles smash through the window, exhausted from battle and carrying a grim package: the grievously injured Michelangelo. Splinter inspects the wound and finds that Mikey’s plastron has been split in twain and the gash nearly reaching his internal organs. Splinter quickly binds the wound with herbs and bandages and urges his sons to sleep, only to find that they’ve already passed out. Each Turtle is plagued with unspeakable nightmares. Raphael leaps at a giant gaping maw head-on, only to be swallowed whole. Leonardo chops his way through a horde of nightmarish monstrosities, only to eventually become overwhelmed by their numbers. Donatello takes flight against his enemies on a winged dinosaur, but the monsters of the night tear both his steed and him down. Michelangelo is worst off, as he is fighting for his very life within the dreamscape. Mikey finds himself cut completely in two, revealing his still-beating heart. “The Mate of the Night”, a decomposing haggish monstrosity, reaches down, plucks out his heart and devours it. 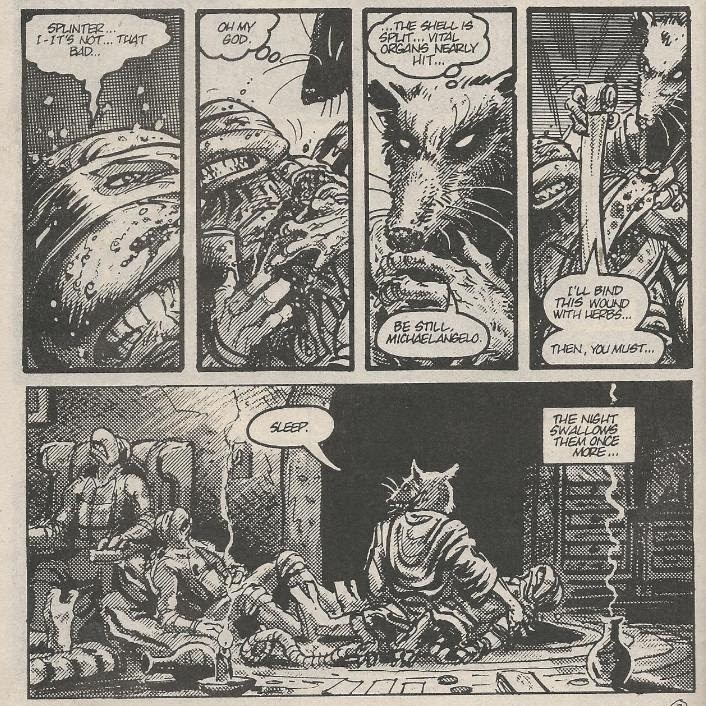 In the waking world, Splinter sees his sleeping children struggling. Returning to his meditation, Splinter seeks to psychically rescue them from their nightmares. The Turtles then find themselves in a linked dream. They are all babies again, paling around on a beach. They are approached by their momma turtle, who leads them down to the depths below the waves. There, they sleep peacefully, curled up with their mother. Back in reality, the Turtles sleep soundly at Splinter’s feet, having been saved from their mental anguish. *"O-Deed" is something of a spiritual sequel to this story. *It is never explained how Mikey got his wound or what's up with their life-threatening nightmares. Though it is pure speculation on my part, I like to think that the physical attack on the Turtles came from the Foot Clan, while the mental attack came from the Foot Mystics, as fits their MO. Similar attacks from the Foot Mystics can be found in stories like Tales of the TMNT (Vol. 2) #2, Tales of the TMNT (Vol. 2) #11 and Tales of the TMNT (Vol. 2) #48 (in the story “One’s Shadow”). Again, this is just my opinion. *This story should not be confused with TMNT (Vol. 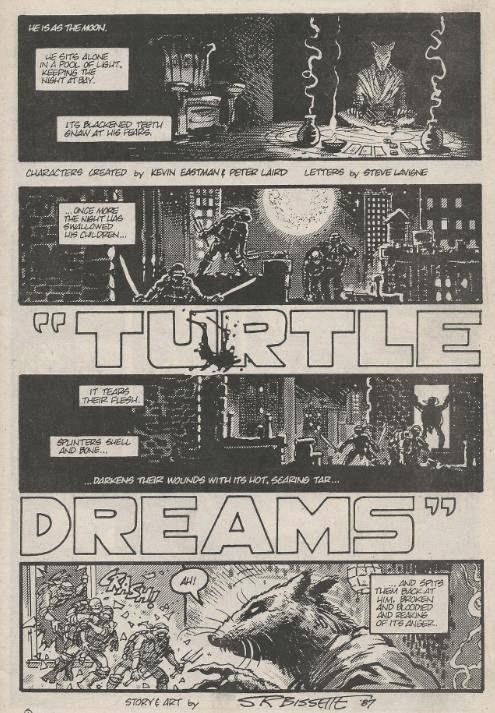 1) #41, which also contained a totally different story titled “Turtle Dreams”. As the opening chapter of the original Turtle Soup one-shot anthology special, Eastman and Laird couldn’t have chosen a more striking and avant garde strip. Steve Bissette, a frequent collaborator of Eastman and Laird’s, is perhaps best known for his gritty, eerie and often times grotesque horror-infused art style. Which naturally means I love the guy. Bissette doesn’t spare the audience any of his trademarked exploitational gore and violence, as we see Michelangelo first brutally wounded and then split in two and devoured by a zombie-thing. The Mirage TMNT book is often remarked as being overly violent and blood-soaked, but “Turtle Dreams” is in a league of its own. The gore might be a little off-putting or over the top, but keep in mind that the worst of it is seen within the Turtles’ nightmares, which are intended to be horrifically exaggerated. On that note, Bissette draws some truly creepy monsters, with that heart-gobbling witch taking the cake. As a nice and surely intentional juxtaposition, however, the ending is quite serene and sweet, as Splinter taps into the primal memories of his sons, taking them back to when they were safest and most secure. If I were to offer one criticism toward the art, it would be that Bissette mistakenly draws the Turtles with four fingers instead of three. 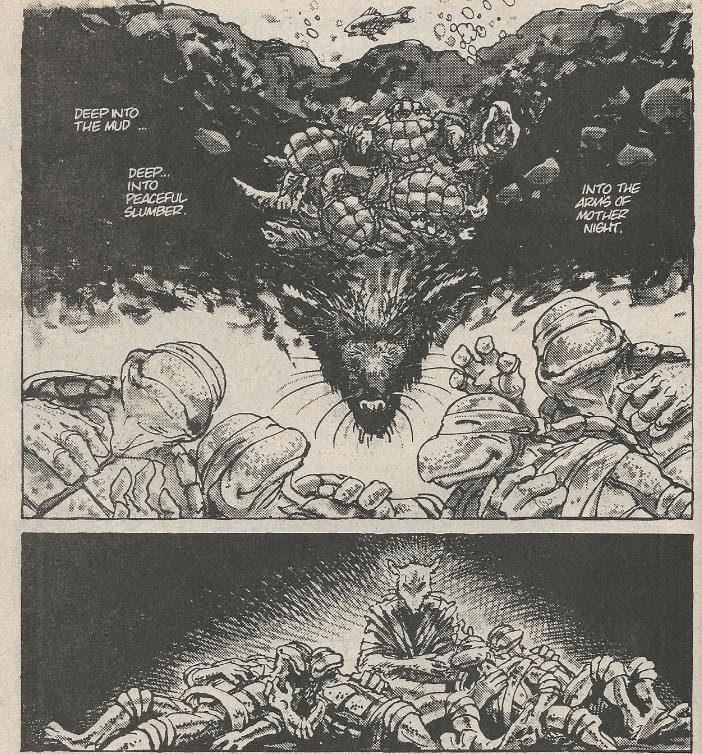 For my money’s worth, I like to think of the predicament in this story as being another mental ambush from the Foot Mystics, as the psychological and metaphysical attack on the TMNT certainly fits their MO. Obviously, there’s no reference to the Foot Mystics or the Foot in general (we don’t know how Mikey acquired that wound), but the pieces seem to fall into place rather well for my personal canon. While this is a story that’s primarily a winner due to Bissette’s memorable artwork, the story runs the gamut of grotesquely macabre and saccharine sweet, so it’s bound to stick with you in one way or another. And even if I still regard the original Turtle Soup one-shot as more “meh” than good, “Turtle Dreams” is definitely a highlight and certainly a great way to open the book. The artwork on this story was epic! Also, the story is pretty intense. It really makes you feel bad for Mikey and realize how dangerous of a life the turtles live, battling overwhelming foes every other night.